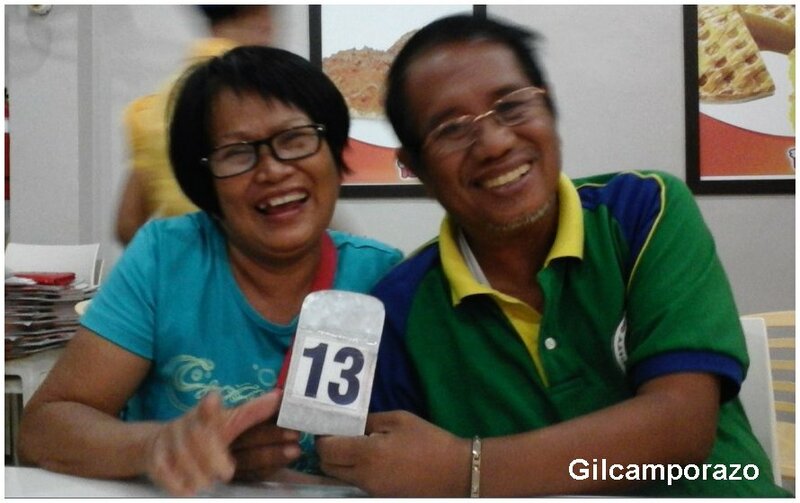 Random Thoughts of Gil Camporazo: We're 64; What We Can Do? We're 64; What We Can Do? 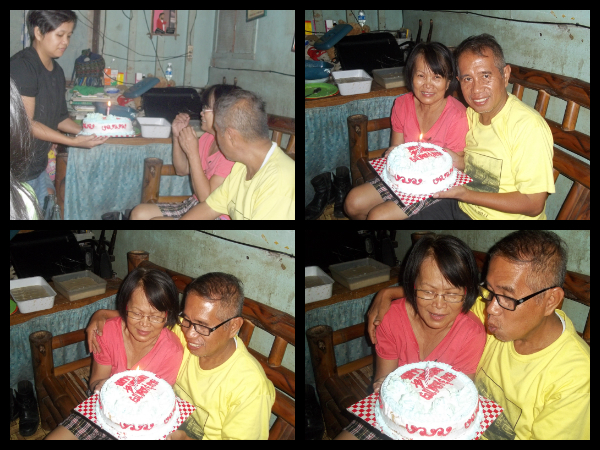 "Happy birthday," greeted the hubby. "Happy birthday, too," replied the wife. This is not rare for there are couples who are celebrating their birthday together for they're born in the same month and date. And there are many married couples holding this birthday. I don't know if this rare and unique one. My wife and I have a synchronous birthday celebration. Today, we jointly celebrate our synchronous 64th birthday. "Are we meant for each other?" We ask ourselves in unison. Only God knows. 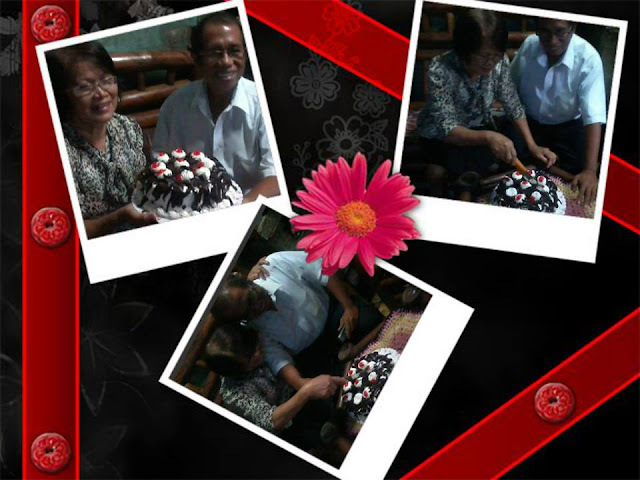 Nevertheless we keep our birthday for 43 faithful years of marriage. We just do it in the most humble and simply way for we can't afford to throw an extravagant birthday party. Our party is only for our six children. My wife and I had never ever had a cake to slice and a candle to blow since we were a kid. However, upon reaching the age of 61, it was the very first time that we had our birthday cake, courtesy of our 2nd eldest daughter who is working as a cook in the eatery inside the Agora in our place. In 2012, as we celebrated our 61st birthday, my wife Rebing and I got out first birthday cake in our life from our daughter, Gingging. For your information, most of our family members are Octoberians. Our late father, Hilarion is October 22. Our eldest sister, Elesita and brother have it in October 3. My two daugthers, Dona and Geeree have it in October 21 and 17 respectively. My wife, Rebecca and I have it together in October 13. When my mother Lorenza was still alive, she just prepared a linugao (porridge) and a pieces of pandesal and a cup of butter for the pan for my birthday and we ate together along with my closed kins, relatives and friends living near our house. But it was not as often as it is. We could have it only when my parents had enough money for the occasion. The memorable moment of our birthday came when our 2nd eldest daughter Gingging surprised us with a carton of chocolate cake she bought after her work past six in the evening. We were surprised then. We opened the carton and said a little prayer of thanksgiving, then sliced the cake. 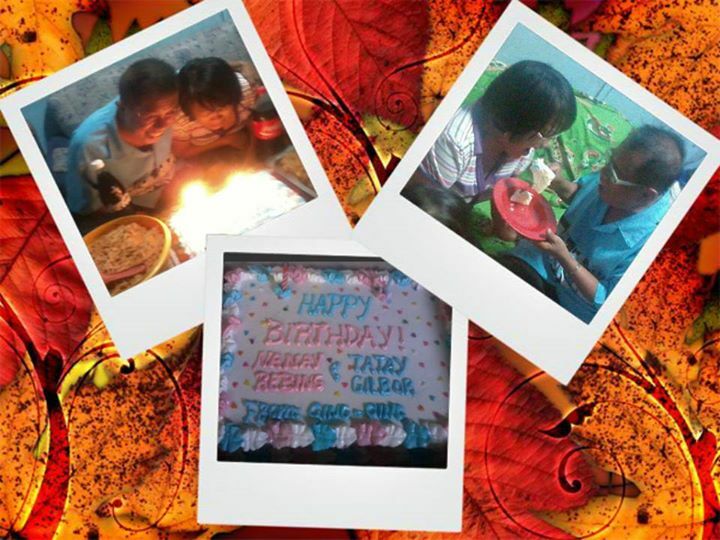 That was the first birthday cake we had had in our life. In 2013, the day my wife and me celebrated our 62nd birthday. The cake was provided by our youngest son, Gilbor Camporazo Jr. in which his wife, Inday Ma Carissa Trenuela Camporazo bought the Black Forest cake with cherries at La Carlota Merci before. This time we had a personalized birthday cake. Still it was the effort of Gingging by sending us a money from abroad to order a cake with a greetings to both of us, her parents. After I said again a prayer of thanks, we put two candles on top of the cake, blew them together and sang the traditional birthday song with the presence of our four children, 5 grandchildren, and two in-laws. We sliced the cake into small pieces, put some on the plate and took a turn of spoon feeding each other. Everyone applauded. It was fun and momentous birthday celebration my wife and I had together. What is in store for us? October 13 is the day. Our pocket is drained. Greeting each other, prayer together, and wishing the best of everything for the coming years according to the Lord's will are the all the things we could do. Thank God for giving us this another year to prove ourselves how faithful we are and how dutiful, loving and caring we are to our children, grandchildren, and how do we serve you by serving our fellow beings. Aww so great to be able to celebrate together as couple. your photos show many happy times. Wishing you all the best. It's so nice to share a birthday with your partner for life, that alone is something worth celebrating. No need for birthday cakes, so long as the love is there. But if there's cake, then that's a nice bonus. Happy Birthday to you and our wife! Awww such sweet pictures of you two together. Happy birthday and from the looks of it, it was definitely a merry one! It is so nice to share not just the wedding date but your birthday date as well. Happy birthday po sa inyong dalawa. Napakapambihira na ang mag-asawa ay iisa ang kaarawan, same year, and same day pa. Nakakatuwa po. More birthdays to come po. Sooo, what cake is it for your 64th birthday? It feels like it was fate that you two are together and sharing the same birthday, plus a lot of people in your family are Octoberians! I think you're an ideal couple as you've been together for so long. You are each other's destiny and it's cool that you even have the same birthday. So very nice to know that you received birthday gifts from your loved ones. Forever loving your wife is the greatest thing to do. Wow! Happy Birthday 64 years old and there are lots of things both of you can walkin together. Many libras in your family. This is an interesting and introspective post... which I hope I will get to write this with my partner when time comes! Lovely couple! Yes, it's rare. At least for me. Happy birthday to you and your wifey sir! There's a lot more things you can do! Stay young at heart. :D All the best! Well, happy birthday! :) You both look amazingly happy. Cheers! Aww, i wish i would be as happy at 64! Happy birthday you love birds, and keep the spirit of love up! Wow, you and and your wife look really happy to spend your birthdays together. :) It's okay to not have a bonggacious celebration as long as your family is close and positive. Awww... This is so sweet! I guess it must be wonderful to be celebrating your birthday with the person you love on the same day at the same time! Happy Belated birthday! I'm sure you're gonna create more memories as a couple. You are just such an inspiring pair. How sweet.. You both look so blissful together. Have a happy birthday! Very great to celebrate together and this is destiny for both of you. Cheers and be happy together. Congrats I am proud of both of you. May God bless you and your family with good health and lots of happiness. Surely you will never forget your wedding anniversary date nor your wife's birthday. Haha! Smart idea. Joking aside, this is such a unique arrangement few other people share. How sweet naman Sir Gil. Celebrating birthday with your wife on the smae day. Less gastos but it will always be a memorable one.